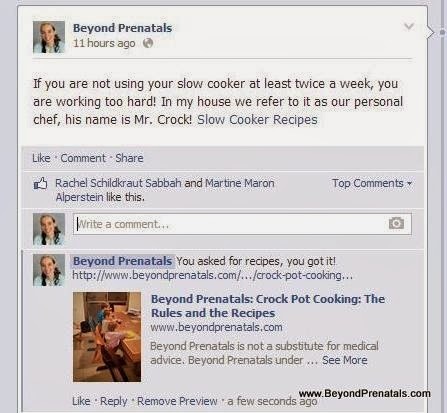 In response to a conversation on the BeyondPrenatals Facebook page, I am posting some rules and recipes for crock pot cooking. Enjoy them and like us on facebook for more health tips. Cook on High 4-5 hours or Low 8-10 hours. If cooking with beans or lentils, don't add salt until the end. If cooking with beans or lentils AND tomatoes, you should use pre-cooked (or canned or frozen) beans to ensure the acidity from the tomatoes won't discourage the beans from becoming tender. Or add tomatoes after beans or lentils are tender. "Saute" in the following recipes, refers to cooking the onions in the crock pot on high with some good quality extra virgin olive oil (or leftover chicken drippings for a deeper flavor) before you add water or other ingredients until the onions become translucent. This can be done while getting dressed. If you need to skip this step, feel free. You will lose some of the flavor but it will still be okay. 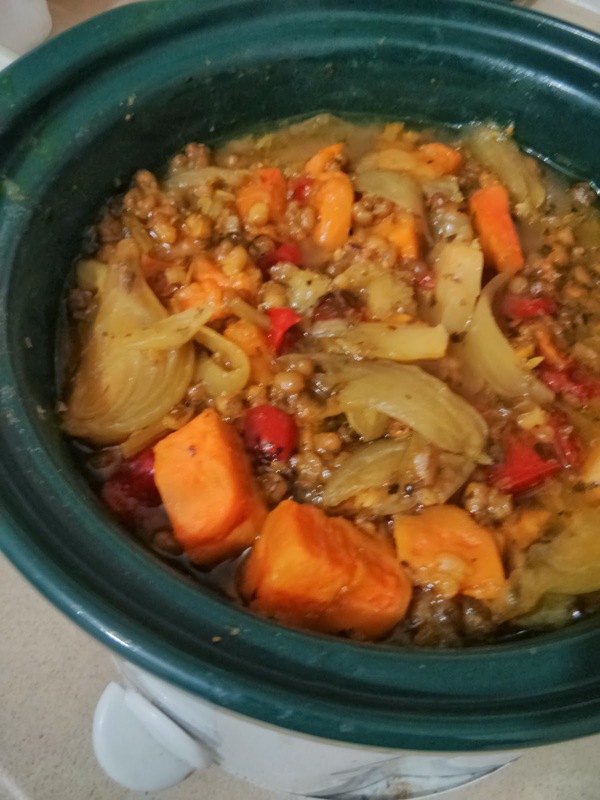 If your mornings are just too hectic, fill up the crock pot the night before, place in fridge, and put it into the crock pot base in the morning. If you want to do the "saute" part, do it the night before. Be flexible. If you start with onions and garlic and add in vegetables you have on hand, beef or chicken or beans, fresh or dried spices, you usually can't go too wrong. If using mushrooms, opt for portobello or baby portobello, it will deepen the flavor. You can also use your crock pot to cook rice and other grains for a few hours (not all day). Works great with "sauteed" onions and mushrooms first. Don't take my measurements too seriously. If you want more of one spice and less of another, go for it! I love reading cookbooks but hate following recipes. All amounts are estimates. Use your cooking judgment. "Saute" 2 onions in the crock pot (either in olive oil or leftover chicken fat). Add about 1 tsp each of dried spices: Oregano, Dill Weed, Parsley and 1/2 tsp turmeric. Stir and let cook until it smells fragrant. Add 2 cups of pre-soaked mung beans, 1 peeled and chopped sweet potato, and one red pepper. Cover with filtered water. Stir to combine. Place two bay leaves just beneath the water. Cook about 5 hours on high or 8 hours on low. When its done, gently stir in some salt but make sure not to mush the sweet potato, keep it chunky or it won't look pretty;) Serve over Fusilli pasta, spooning the extra juice on top too. 1. Whole chicken over 2 cups of rice + 4 cups filtered water. Cover chicken in salsa or matbucha and cooked black beans. 2. Whole chicken rubbed with oil and salt, freshly squeezed lemon juice, and thyme or fresh dill (or other spice you love), surrounded by sweet potatoes. Cook on low all day. Can also be cooked over rice+water. 3. Coat pot in canola oil. Place whole chicken in pot. Cover chicken in honey and then unsweetened coconut shreds. Cook on low all day. This is not as good as beef stew cooked in a dutch oven but if you want meat for dinner and you are short on time, it's pretty good. Layer onions, mushrooms, carrots, garlic, celery. Add cubed beef, 1 cup of red wine, 1/2 cup of water, chopped packaged tomatoes or canned stewed tomatoes, bay leaf, thyme, coarse salt, black pepper. When it's done stir in some red wine vinegar. Spices of your choice (we used: paprika, cayenne, cumin, pepper). When cooking beans, always add salt after the beans are cooked or they won't get tender. Put everything in the crock pot, add the spices and water to cover. Cook on low all day. gently add salt to taste. Make some brown rice or another grain to serve it with and enjoy! For a more traditional veggie chili, you need to go out of the crock pot, here is my favorite. Place in crock pot in the following order (all chopped): Olive oil to coat bottom of pot, 2 medium eggplants, 2 onions, 2 zucchini, 8 oz. Mushroom, 2-3 potatoes, 4 cloves garlic. Add seasonings: pepper, basil, oregano, ¼ cup balsamic vinegar, 2 tbs maple syrup. Add chopped packaged (r canned) tomatoes. Add 2 cups cooked chickpeas. Drizzle with some more olive oil. Don't stir. Cook all day. "Saute" the onions and garlic with the olive oil, oregano, pepper until the onions are translucent, about 20 minutes while you are getting dressed in the morning.. Add the carrots, potatoes, split peas, chicken stock, and hot dogs. If you are home, skim off the foam while cooking. Cook on low all day. Add salt. If you prefer your split pea soup with thyme, replace the oregano with thyme. 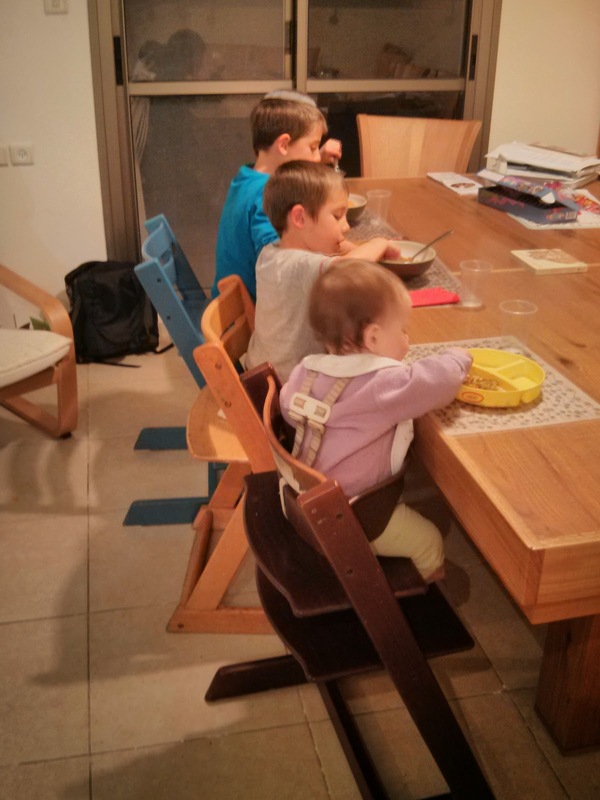 My kids enjoying mung bean stew over pasta tonight. Recipe above.. So what do you think of something like this? I would be nervous about maintaining a safe temperature. Stick a thermometer in it to be safe.